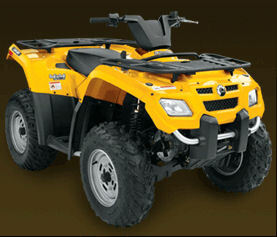 Can-Am Outlander 400 H.O. 2007 specs - Quads / ATV's In South Africa - Quad bikes and ATV's in South Africa - Quad specs, Can-Am Outlander specifications and ATV pictures for Can-Am Outlander 400 H.O. 2007 and others. Quad bikes and ATV's in South Africa - Quad specs, Can-Am Outlander specifications and ATV pictures for Can-Am Outlander 400 H.O. 2007 and others. Instumentation : Digital gauge : speedometer, odometer, trip and hourmeter, gear position, 4x4 indicator. Fuel gauge.